Cláudio Carvalhaes, theologian, liturgist and artist, a native Brazilian, completed his Ph.D. in Liturgy and Theology at Union Theological Seminary in New York City in 2007. He earned his first Master of Philosophy degree in Theology, Philosophy, and History at the Methodist University of Sao Paulo in 1997 and a Master of Divinity degree from the Independent Presbyterian Theological Seminary (Sao Paulo, Brazil) in 1992. In the summer of 2016, Dr. Carvalhaes joined Union Theological Seminary in New York City as the Associate Professor of Worship. Previously, he taught at McCormick Theological Seminary, Lutheran Theological Seminary in Philadelphia and Louisville Presbyterian Theological Seminary. Carvalhaes is an ordained pastor within the Presbyterian Church (U.S.A.). 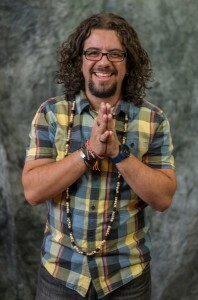 A much sought after speaker, writer, performer, and consultant, Carvalhaes preached at the Festival of Homiletics, Academy of Homiletics, Wild Goose Festival, Proctor Institute for Child Advocacy Ministry, Jubilee 800 Order of Preachers of the Dominican Order in Italy, Societas Liturgica in Belgium, Council of World Mission in Mexico, International Academy of Practical Theology in Brazil, at the Forum of Liturgics and Ethics at Hildesheim Germany and other places. He led worship for the All African Council of Churches in Mozambique, taught at the Global Institute of Theology of the World Communion of Reformed Churches, and leads worship and teaches at the Hispanic Summer Program since 2013. Carvalhaes has two books in English: “What Does Worship Have to do With it? Interpreting Life, Church and the World Liturgically” (Cascade Books, 2018), “Eucharist and Globalization: Redrawing the Borders of Eucharistic Hospitality” (Wipf&Stock, 2013) and is the editor of “Liturgy in Postcolonial Perspectives – Only One is Holy,” (New York: Palgrave Macmillan: Postcolonialism and Religions Series, 2015). His next book will be “Preaching and Liberation Theology: Metaphors For Our Time,” (Abingdon Press, 2019). He has edited “Forms of Speech, Religion and Social Resistance,” CrossCurrents, Vol. 66, No. 1 (Summer 2016); “The Poetics of Religion in Rubem Alves.” Editors: Claudio Carvalhaes and Paulo Augusto S. Nogueira, Estudos de Religião, Brasil V. 32, N. 2 (Summer 2017); and “Black Religions in Brazi/Religiões Negras no Brasill.” Editors: Cláudio Carvalhaes and Marcos Silva. CrossCurrents, Vol. 68, No. 1 (Winter 2017). Bilingual: English and Portuguese. Carvalhaes is also the author of four books in Portuguese and two edited ones celebrating the work of Jaci C. Maraschin and Ivone Gebara. He has authored chapters in more than 25 edited volumes along with more than 50 articles. He has given academic presentations, performances and delivered sermons at over 40 conferences as well as academic societies. Besides the United States, he has lectured in Brazil, Colombia, Costa Rica, El Salvador, Canada, Germany, Belgium, Netherlands and Mozambique. A member of the American Academy of Religion, where he is a Member of the Theological Education Committee, 2017-2022. He served on the board of the Liberation Theology Group and was the co-chair of the Arts, Religion, and Literature Group. He is also a member of the North American Academy of Liturgy, Academy of Homiletics and Societas Liturgica and International Academy of Practical Theology. Dr. Carvalhaes serves on the editorial/advisory board of academic journals and publishing houses including Currents of Encounter Series (Brill, Netherlands); Cross-Currents; Ecclesial Practices: Journal of Ecclesiology and Ethnography; Horizontes Decoloniales/Decolonial Horizons (Argentina) and TEAR: Journal of Liturgical Resources of CLAI, Conselho Latino Americano de Igrejas. Carvalhaes is married with Katie Perella and has three kids.